Among all the complexities and challenges in local governments, demands by citizens to be more involved in framing and determining public policy may be one of the most topical issues facing managers today. The City and County of Eau Claire utilized a unique approach to involve citizens in civic problem solving and strengthening democracy within the greater Eau Claire community. This session will provide you with background information and definitions regarding citizen engagement and discuss why local government should be involved in this endeavor. The session will also review the citizen engagement model and process utilized in the Eau Claire community, provide hands on training for use of the model, and share the results and lessons learned during implementation of the citizen engagement model in the Eau Claire community. 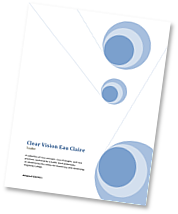 Clear Vision Eau Claire is a planning process based explicitly on a participatory model of meaningful citizen involvement. The participatory citizenship model promotes collaborative problem-solving, redefines problems from diverse views, promotes public dialogue, restructures mediating institutions (governments, schools, community organizations) and defines citizens as primary actors in effective public problem-solving.